Our trip was an 11-hour car ride (due to a few excess tinkle stops for the dog.) Blitzkrieg took care of business before we left so no doggie pickup bag issues there. 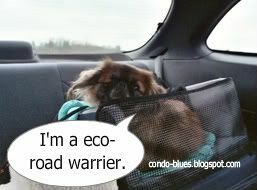 However, The Rubbish Diet did say it was OK to invoke a doggie waste management exemption for the entire Zero Waste Road Trip Challenge. Blitzkrieg is pleased we accepted her exemption. Pre-made sandwiches Usually I just throw the bread, meat, cheese, and condiment packets, etc into a cooler and we make sandwiches after we stop for a meal. Sometimes we have to toss the food in the cooler before we start back home because we forgot to keep ice in the cooler and the food spoils. The pre-made sandwiches saved us travel time because I we didn’t have to make our food before we ate it, and money/waste because there weren’t many leftovers to potentially spoil. Hummus I made the hummus and recycled the chickpea cans at home before we left. Grape tomatoes given to us from my Mother in Law’s garden two days before we left town. I didn’t want these yummy gems to go bad while we were out of town, so I threw them in the cooler. We ate these as is and dipped them in the hummus. Frozen fruit chunks We originally bought these on our last grocery-shopping trip for smoothies but decided to put some of the fruit in a container to take with us on our trip while the rest of the fruit stayed in the freezer for future smoothie time. o Coffee in reusable travel coffee mugs. We refilled the mugs on the road when we got a bit of the I’m driving a lot drowses. And before you ask, no, the cashier at the gas station didn’t look at we weird when we asked if we could use our own mugs when we bought our coffee. o Squeeze bottles full of orange juice Husband was training for a half marathon relay and we wanted to do healthy drinks on this trip instead of bottles of soda. I recycled the juice container at home before we left town. o A reusable 3-gallon water jug full of tap water for Blitzkrieg for the road and just the local well water at our destination gave him (or us) tummy issues. We kept everything cold in the cooler with a reusable frozen ice pack. I choose to pack everything in reusable plastic containers because they were lightweight, wouldn’t break, and more importantly that’s what I already have. The only little slip up we had on the way to Georgia was we needed a restroom break and the only available place was a gas station/store. We didn't need to buy gas so we bought juice in plastic bottles because it seemed very rude to just use the facilities and leave without buying something from them. Fortunately, our host and hostess recycle so we were able to recycle one of the empty juice bottles at their home. The other we drank on the trip back to Ohio, so we recycled it at home. The week we spent visiting and sight seeing in the Georgia Mountains wasn’t officially part of the Zero Waste Road Trip Challenge although I was still conscious of it so I tried to minimize the trash we made during the week. That was easy because as I said before our host and hostess recycled, used cloth napkins and place mats, and compost food scraps. We ate many of our meals at home because our hostess is a fabulous cook. We ate out a few times and most of the places we ate at had reusable plates and silverware but two used paper napkins. I went with it because I would have felt strange bringing my own cloth napkins with me and I didn’t have room in my purse that doubles as my camera bag to do so either. Unfortunately, the big camera tiny purse issue also made it difficult to stash the reusable shopping bag I grabbed from its place in the car trunk as we spent a day doing the touristy shopping thing in a fake Germaneque town in the American Smokey Mountains (Irony? Check. Kitschy? Double Check! Had money for unusual arty crafted home goods and found nothing worthwhile to spend it on? Triple Check! ) However, we did buy some very good local wine. (Strange side note: We’re in the Bible Belt and yet there are local wineries everywhere. Am I the only one who finds this an odd combination?) Note to self: Next time I need save my self some trouble and buy a fold up reusable shopping bag to put in my tiny purse for possible vacation purchases. Munster cheese sliced and eaten as is. Once the cheese was open, I stored it in one of my clean reusable containers. o Coffee. In this case, we had to buy coffee on the road because I forgot to wash our dirty reusable coffee mugs. Those dirty mugs baked in our car in the hot Georgia sun for a week. By the time, I wanted to use one on the way back home well, let’s just say that it needed more than a good rinse out. Fortunately, we dodge the trash bullet because our city recycles the material that the road coffee cups and tops were made from. Whew. Again, we kept everything cold in the cooler with a reusable frozen ice pack that we refroze in our host and hostesses freezer. Total food cost for two meals for two adults: $26.00. Much swankier fare than you could get at a roadside café and much cheaper than buying lunch and dinner for two at McDonalds! I had empty clean food containers from the trip down. I know I should have taken them to the grocery with me to have them refilled but I didn’t. Partly due to laziness, (I was on holiday after all) and partly because I felt a little strange doing it. I know other people do this all the time and don't think anything of it but I'm not there yet. Fortunately, the Greek pasta salad and stuffed grape leaves that we bought at the store were in plastic containers that I could wash out and reuse when we got home. In fact, I just filled one of those containers with fresh mint from my herb garden and gave it to a party giving friend as a Hostess Gift (How Martha Stewart of me!) Who says that recycling always has to happen by putting something in a bin? We only had a few slip ups. One of which, and I kid you not, was in the form of banana peels. We bought a bunch of bananas because the local Georgia peaches were picked over and looked not so great at the time of purchase. After eating lunch, I packed the spent banana peels the picnic hamper to compost at home and put the hamper in the trunk of the car. Several hours later in the hot car trunk, they started to smell - Bad. We ended up tossing the peels in the trash at the next rest/gas stop on our trip home. Some of you may say that I should have tossed those peels in the grass because they are biodegradable. That’s true; however, I didn’t want to be a litterbug because throwing those peels on the ground is still considered trash because it could attract animals. Another slip up came when my camera had some sort of hair on the lens when we were in Georgia. I tried using a (reusable) lens cloth and an air bulb to clean my camera lens. It didn't work. I wanted to try blowing some canned air through my camera body to see if that would take care of my problem. I had to buy some and wouldn't you know it, the store didn't sell single cans. They only sold two cans shrink-wrapped together in plastic. So I ended up buying it (at least we didn't use a bag to take it out of the store) and had to toss the plastic wrapper in the trash. Grrrr! I wasn't very happy about that. However, I was able to fix my camera with the compressed air and saved myself from a costly camera repair. Therefore, my final trash tally for the week long trip was four paper napkins, 1 plastic wrapper from the cans of compressed air (when the canned air runs out, I'll put it in our recycling bin) and two banana peels. Not too bad. What do you think? I have to say that is a lot to go though, but not too hard and a great way to cut down on waste, I may have to try that on my next trip. Very impressive! But how did you enjoy the trip? Blitzkrieg really enjoyed the hiking part of the Appalacihan trail too!